You make a reservation for a Website or FAX. We would accept cancellation and changing your reservation. Please feel free to contact us. We respond to your inquiry around the clock. Please check information about cancelation of service and available seats by our time-table. We would accept your reservation until 2 hours before departure. Other passengers may cancel their reservation and you may get available seats on the day, even if seats are reserved. So please feel free to contact us. Please come to waiting room at Miyajima 3rd Pier by 10 minutes before departure. Please inform us of your name. Please buy your ticket by vending machine. Our staff will show you to pier, when the boarding time comes. After cruising, you will get off the ship at pier which you got on ship. Can I take your ship without reservation? 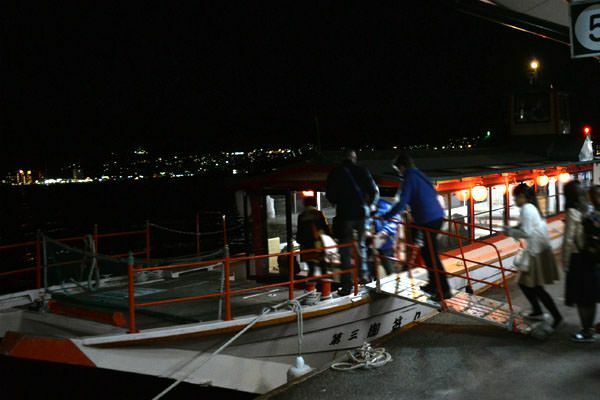 Miyajima Light-up Cruise always requests you to make a reservation. We will accept reservation until 2 hours before departure. First of all, please check our timetable on our website. Even if you can't find available seats which you want, please free like to contact us,because other passengers may cancel their reservation.